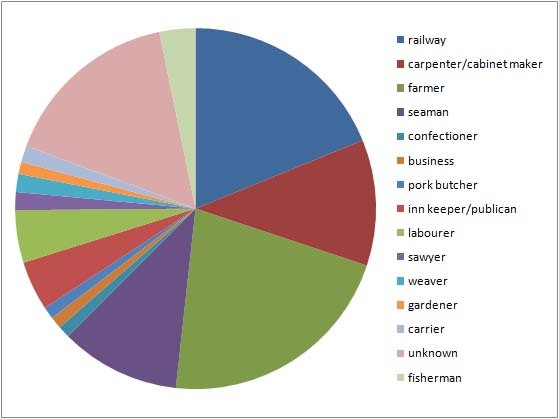 This entry was posted in Dorfprozelten research, Family History and tagged 2011 Labor Day, Dorfprozelten, Labour Day, occupation pie by cassmob. Bookmark the permalink. Even though you have little information on the women, I find the number of different types of jobs held by the women to be absolutely fascinating. Some of them sound like they were really ahead of their times. Yes I think all the women of those early pioneers took on many responsibilities though if asked they’d probably have said their occupations were “domestic duties”, making it hard to classify them objectively. Other supported their husbands when times were tough in other ways with court cases or bankruptcies. They were interesting people I think. I love the fact that the 2x great grandmother was a stewardess on ships probably made it simpler for her to make the voyage to Australia when she was no longer a young woman.